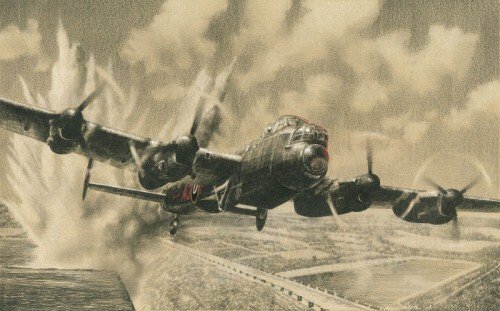 Richard’s stunning pencil drawing, completed on buff paper with colour highlights, depicts Lancaster AJ-F, piloted by Canadian Ken Brown, powering away from the Sorpe Dam as a huge plume of water erupts behind it. This was the second and final attack on the impenetrable dam which just a few hours earlier was attacked by ‘Johnny’ Johnson’s Lancaster AJ-T. Both aircraft scored direct hits. 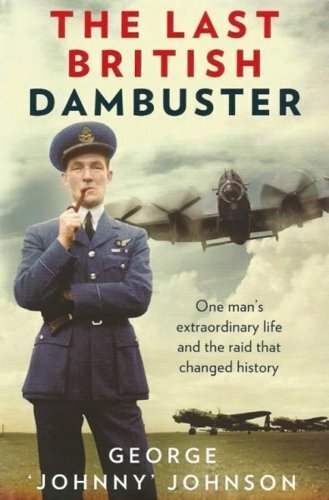 Johnny Johnson is one of very few men who can recall first-hand the most daring and ingenious air raid of all time – Operation Chastise. In this superb book he relives every moment of that fateful night with unique wit and insight. Johnny’s story is like no other. The Bomb-Aimer on Lancaster AJ-T that attacked the Sorpe Dam, scoring a direct hit. Ground Crew with 617 Sqn, he was involved in fitting special modifications to the Lancasters for the raid.